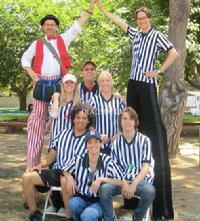 Motivate your staff with innovative corporate team-building games, offered by Dial M Productions. Our proven format inspires and unifies teams. With over 97 techniques and exercises, these novel corporate team-building games encourage participation and spark creativity�with plenty of laughs! We�ll personalize any event, so your goals are reached. Step out of the box with unique corporate team-building games like these: comedy mentalism show, improvisational games, Vegas casino events, take-offs on The Apprentice Show and The Weakest Link Game Show, Is Your Department Smarter Than A 5th Grader, Corporate Culinary Challenge, among numerous others. Does your company need a morale boost? Energize them with teambuilding events by Dial M Productions. Does your staff cringe at the mere mention of corporate team-building activities? Not anymore. Dial M Productions has the knack for putting a new spin on motivational events. Since 1985, we�ve specialized in corporate team-building activities while renewing company spirit, teaching communication, enhancing listening skills and strengthening management proficiency and more. Our high-energy workshops are set in a risk-free environment, so team members can explore and learn theory through practice. Put a positive twist on your corporate team-building activities with Dial M Productions. Planning yet another seminar? 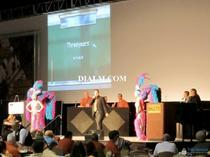 Break out of the box with corporate team-building seminars by Dial M Productions. Our expert motivators use interactive games and entertainment, customized to your company�s objectives. Dial M has specialized in working in the corporate environment since 1985. Our corporate team-building seminars zero-in on creativity and versatility to boost morale and inspire company spirit. All of our novel corporate team-building seminars ensure participation and fun�in a risk-free, enjoyable environment. Our games develop teamwork and build management skills while enhancing communication and listening skills. Unlock the power for your next seminar with www.dialmproductions.com. Dial M Productions presents an evening at the New York New York Hotel in Las Vegas, Produced by Peggy Phillips, of Dial M Production in Los Angeles. This event was a hit! With an expected audience of 500, Extension Technology, Inc., (host for the event) DIAL M entertained close to 2000 invited guests. Dial M Productions provided A Dial M Murder Mystery, 10 Piece dance party band, Showgirls, sound, lights, coffin party favors, Go-Go Dancers, and walk around talent. And on our www.dialm.com web site. Call anytime with questions. We look forward to working with you. 818-953-4246. We belong to copyscape and will be notified if pictures or content is copied without permission.